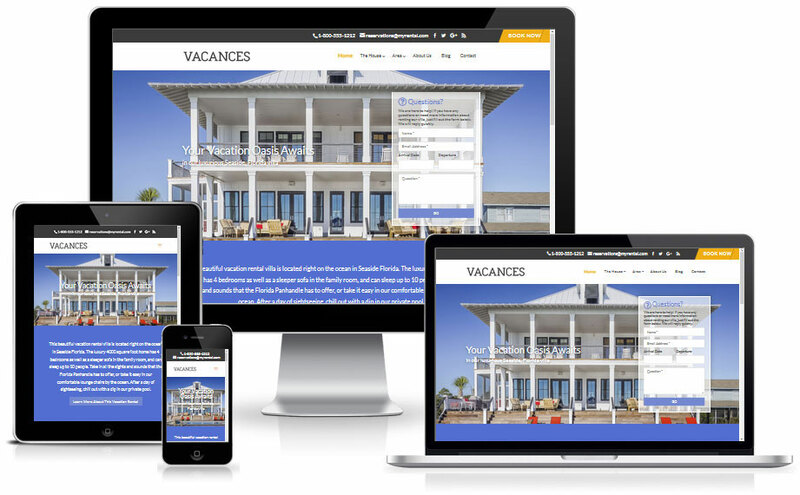 if you need to build a website for a vacation rental property, Vacances is the answer, offering you a professionally designed and effective website to market the property. Visitors on a mobile phone can use their phone’s click to call function to call or text you right from your website. All visitors can also click your email address to email you directly. People want to know what’s in it for them – not just that it has 4 bedrooms and 3 baths. Let them know why they will love staying in your home, with photos and some details. People have scrolled down to the bottom of your page, so they must have seen enough of interest. Don’t lose them now – a strong call to action can lead them to your booking calendar to check availability. Don’t lose potential visitors, this contrasting button is always within reach (on desktop and iPad) making it quick and easy for people to get to your booking calendar. Make it easy for people to contact you and start a conversation. The integrated Caldera Forms plugin stores form submissions in the database, meaning you will never miss a lead. Offer a brief overview of your home, and a link to lead people to your home details page to learn more about the features your house can offer them. 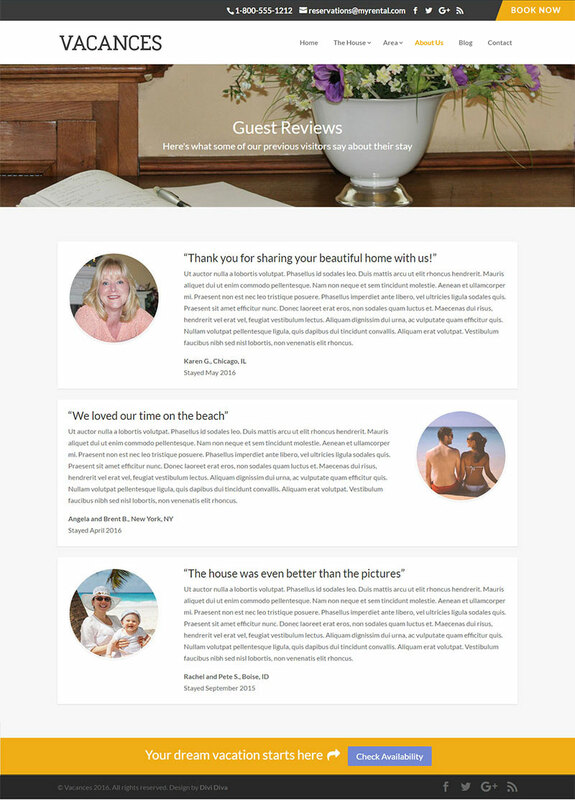 Provide some highlights from guest reviews on your Home page, with more detailed reviews on their own review page for people who want to read more. 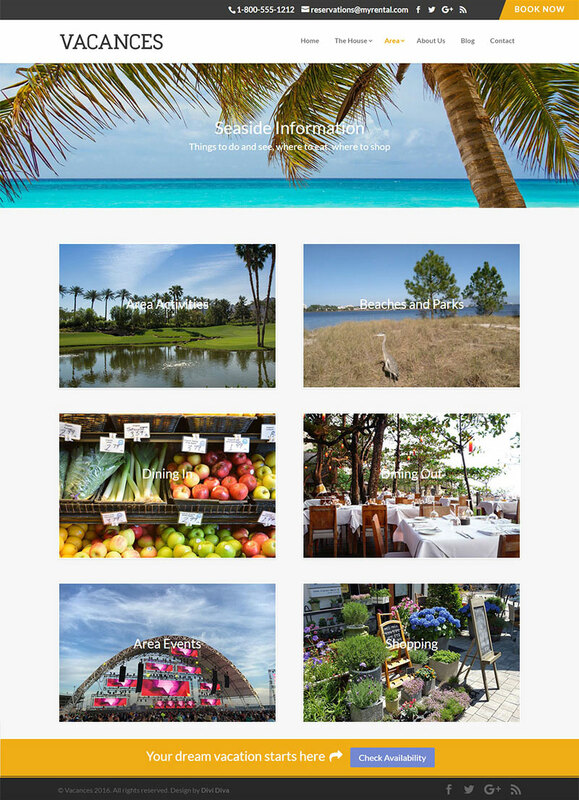 Integrated Master Slider plugin lets you create a slide show featuring photos of the key features of your vacation rental home. People want to see detailed photos to decide whether your property is going to meet their vacation needs. The Font Awesome Icon Set is integrated and ready for you to use. The House overview page is set up with Font Awesome icons to highlight key facts about the house. Visit http://fontawesome.io/ to learn more about using Font Awesome icons. The About the House page gives you an opportunity to provide a detailed overview of the vacation rental property along with any relevant area amenities. You can also include a section with details on the amenities that are included with the vacation rental. You can easily add additional sections to the About the House page if you wish, by loading the saved Section Layout from the library. You can also add a Map Module showing the location of your vacation rental property. You will need to create a Google Maps API key (instructions on how to do so are found in the Divi Theme Options) in order to create a Google Map. Optionally, you can include an image gallery with descriptions of each photo, to make sure people know all the key features of each room. The images open up to a larger size image in a lightbox. Viewers can scroll through the lightbox images, or just enlarge the ones they are most interested in seeing. Reviews from previous guests are important to give people confidence that they are making the right choice. You can easily add additional reviews by adding the saved left image and right image review sections from the library. 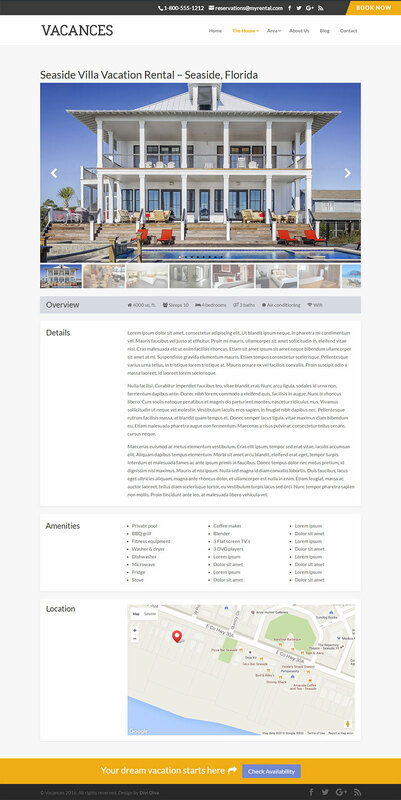 An “about the owners” page is important on a vacation rental website. Knowing that they are renting from “real people” also gives people confidence. Tell them about yourself, and why you chose to have a vacation rental property in this area. 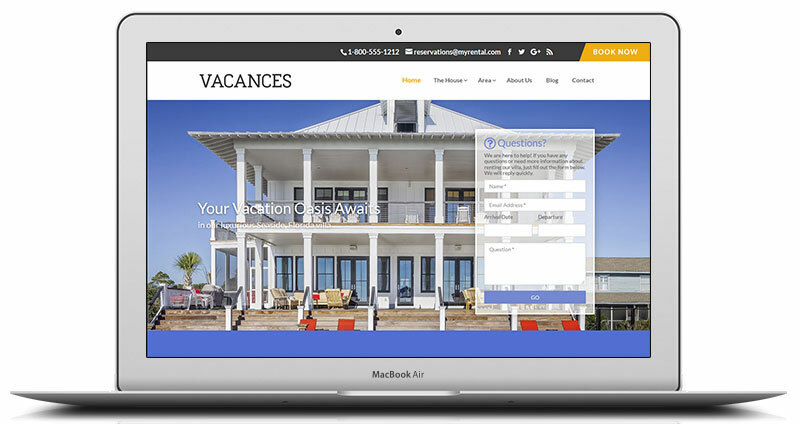 Updating your vacation rental website with local area information is a great way to help bring traffic to your website through search engines. Posting frequent updates about local restaurants, activities, events, attractions, etc. can help to build your search engine ranking. 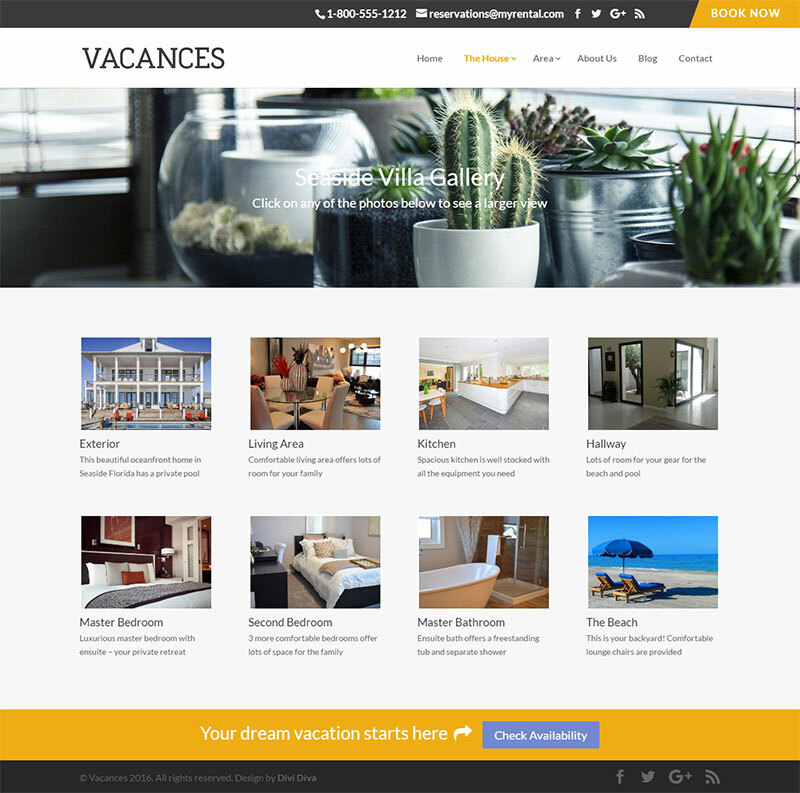 The Vacances theme also includes a layout that allows you to write a general overview of each category of area information. Blog posts can do double duty – we have included the blog posts from that category on each area information topic page. You can choose to use one of these methods – the blog section or the area information section – or both. People may look for information in different ways. They may check out your blog for news and updates on any topic, but if they are looking for something specific (where to shop, where to buy groceries, etc.) they may check out the area information section for that topic. The blog and area information sections are designed to be visually appealing with images linking to more information. It is important to give people an easy way to be able to share your blog posts through social media. This can help bring more traffic to your site – and more traffic means more potential rentals. I have used the Monarch plugin from Elegant Themes on the demo site to create social sharing buttons. The Monarch plugin is a premium plugin that is available with the Developers or Lifetime subscriptions from Elegant Themes. If you don’t have access to the Monarch plugin with your subscription, there are also many free social sharing plugins available in the WordPress repository. If you have captured people’s interest with the features of your vacation rental property, they will want to see if it is available on the dates that they were thinking of staying. Instant access to this information is obviously better than having them contact you and wait for you to send them the information – by then they will have probably moved on to another property. I have used the Pinpoint Booking System in the demo to display an availability calendar and allow people to make a reservation. You can learn more about the features of the Pinpoint Booking System here. It is available in a free version (which is used in the demo) and also a premium version with some extra functionality. You can use it in conjunction with PayPal if you wish to have people make payments at the time of booking. There are also other (mostly premium) availability and booking calendar options for WordPress, so you can use the calendar system that best suits your needs. The Rates and Reservations page also includes a Rates table – many rental properties and areas have “seasons” and charge more for rentals during the high season and less during the low season. 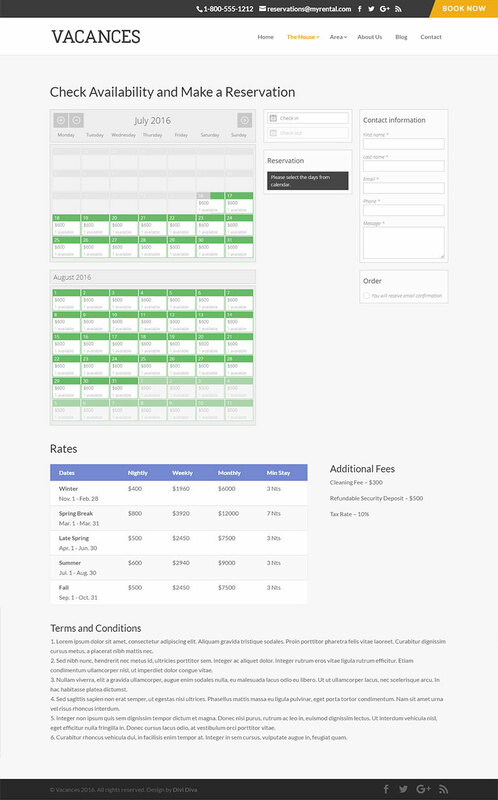 Having a Rates table gives people a chance to see the rates at a glance. The Rates table layout is included in the theme download package- you just have to edit it to suit your seasons and rates. 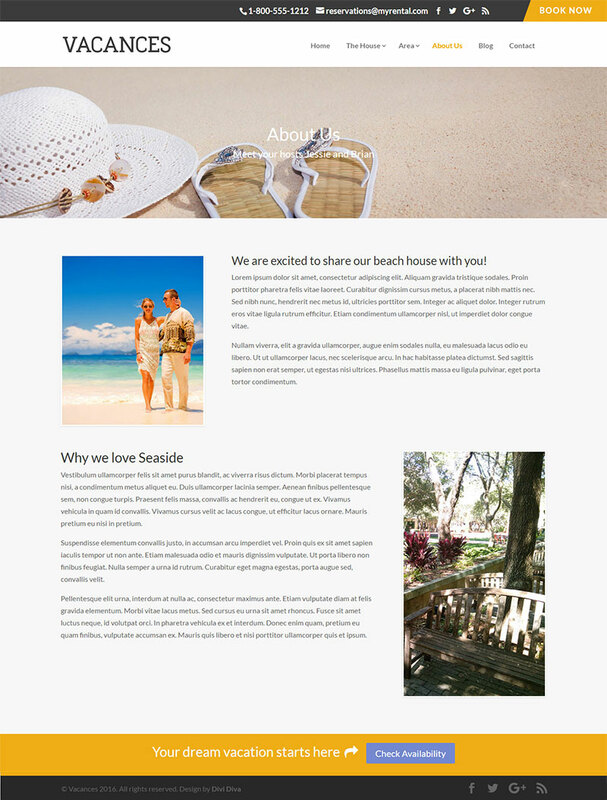 In order to use the Vacances child theme, you will need the Divi parent theme for WordPress, which is not included with this product. 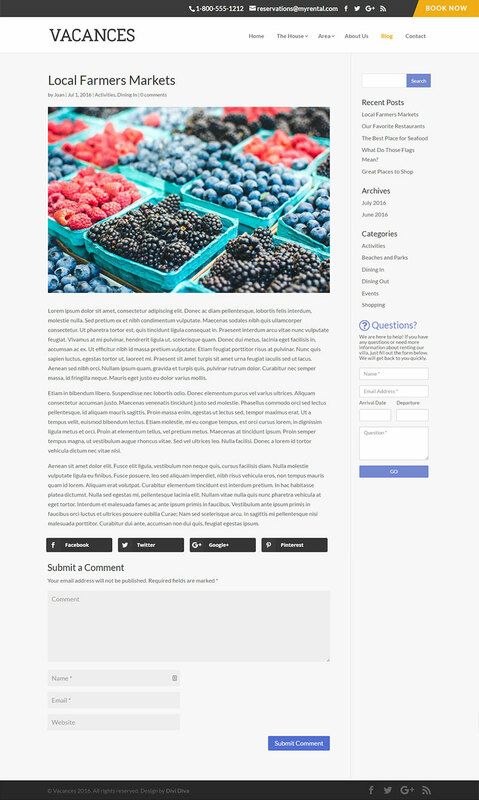 You can purchase an annual subscription from Elegant Themes, which includes the Divi theme. You will also need a hosted WordPress website. 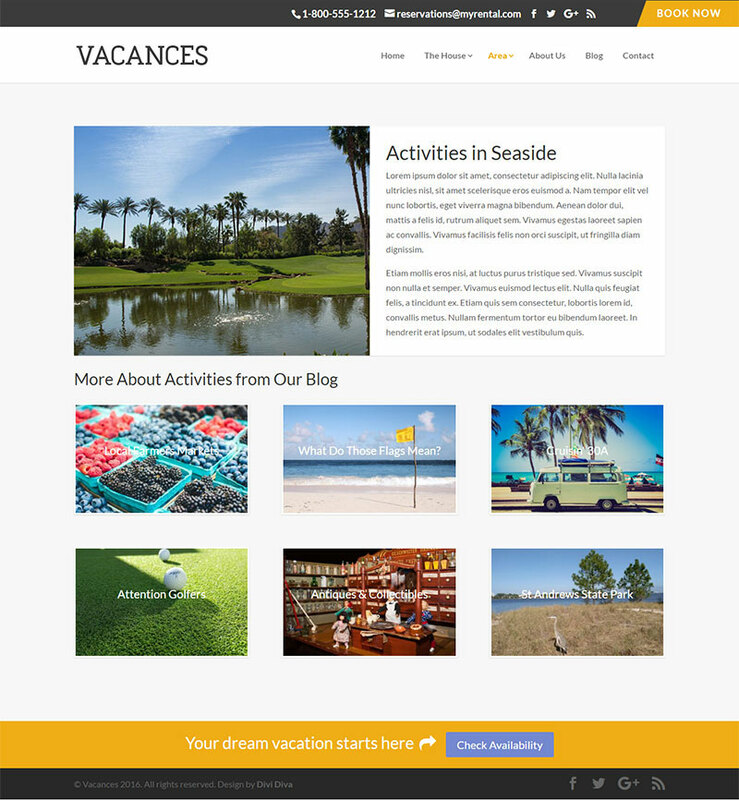 The current version of Vacances (V1.1) is compatible with Divi 3.0.105 and up. 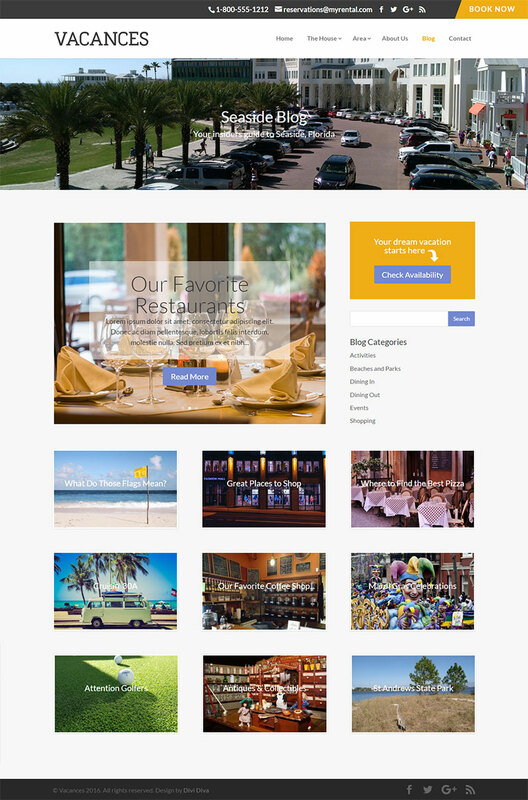 It is highly recommended that the theme be installed on a new install of WordPress.